Week 3 was about art. Have you ever wanted large scale art for a room but felt stumped at what you could do on a limited budget? Well, if you haven’t heard of “Engineer Prints” before, I’m about to blow your mind. You can get 24 x 36 size prints (that’s HUGE… think about a normal 8×10!) for less than $3. Yep. You read that right. Because they are in black and white and printed on thin paper, they are incredibly reasonable. They are used by architects and draftsmen to print out drawings and blueprints of buildings. Basically you can think of them as super huge photocopies. 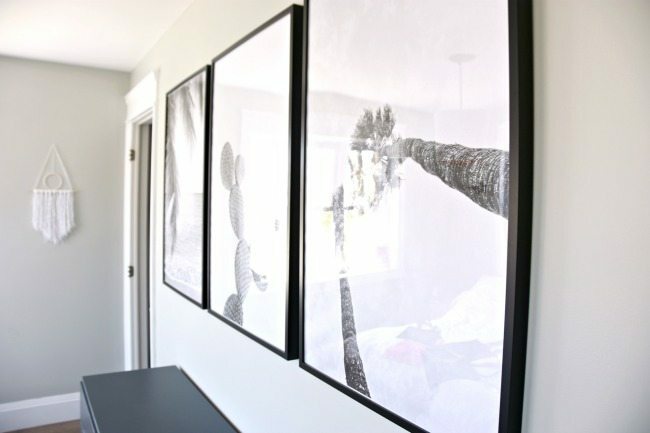 I had liked the gallery wall that was hanging above the dresser in our bedroom, but it wasn’t very striking and I realized that I prefer a gallery wall when you can stand up close to the pictures (like in a hallway). When they are above a piece of furniture, it feels so far away that you can’t really enjoy the art. Going big, on the other hand, solves this issue. I didn’t want huge family photos staring at me while I’m in bed. I wanted something more relaxing, maybe with a nature theme. 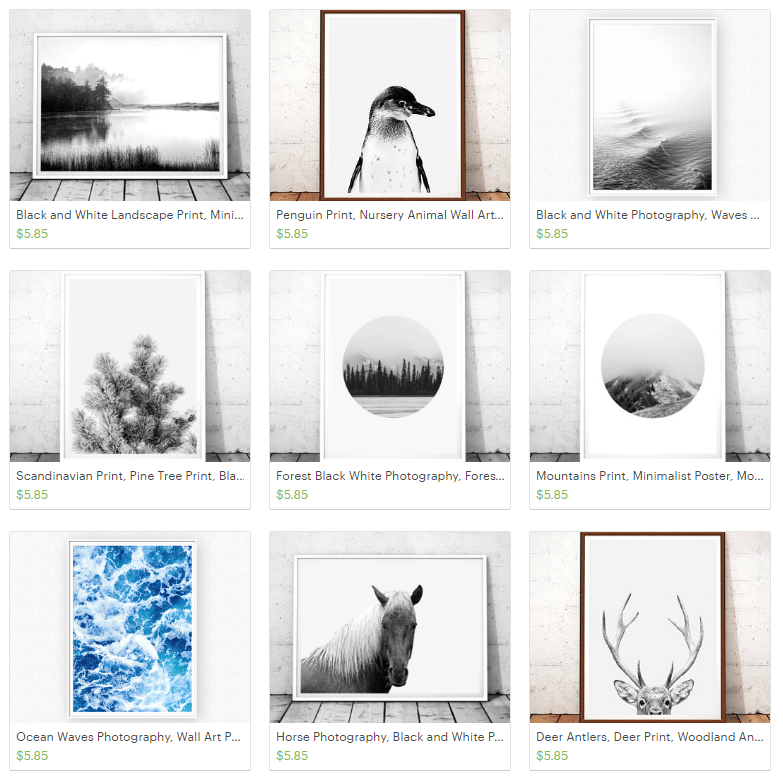 I went onto Etsy to check out what I could find in the way of black and white digital download art. Turns out… A LOT. I poured over tons of shops and in the end decided on ordering a few from the shop AndyxAnny. The store has a huge selection (including those animal photos that are super trendy for kids nurseries right now!)…. 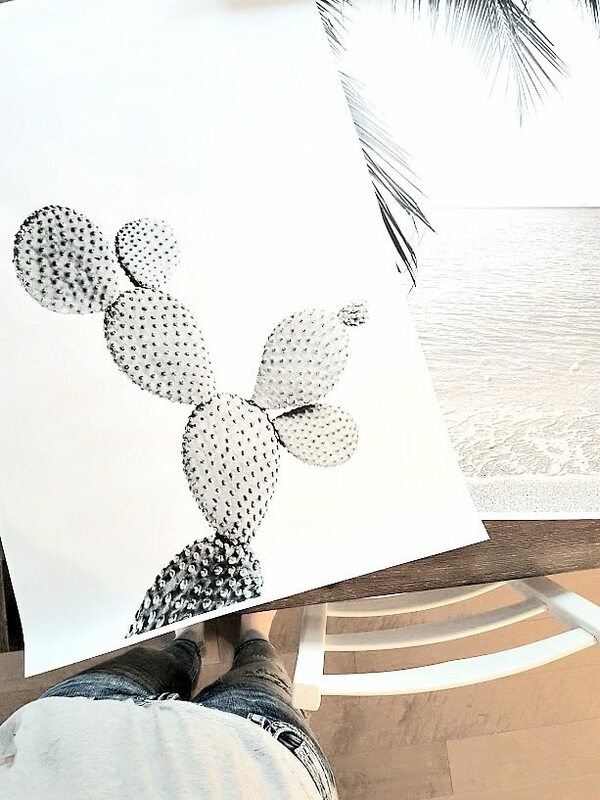 It was hard to narrow it down, but I decided on this cactus print, this palm tree print, and this beach print. Then it was just a matter of uploading the images to the Staples Copy & Print website and ordering them as the engineer prints (you can also take your images in on a USB stick to your local Staples if you don’t want to order online). They come all rolled up, as you imagine a blueprint would. Then I grabbed these Ribba frames (61cm x 91cm size) from IKEA. I decided to go for the black ones because we have black sconces by our bed on the opposite wall, so I figured it would be nice balance. You just have to pop them into the frames, mount on the wall, and it’s as easy as that. I love how they turned out. They make that whole wall so much more dramatic, and it makes the room feel larger too. In terms of budget, each engineer print costs $3 and the Ribba frame runs $25, so in total you’re looking at less than $30 per piece. Pretty incredible for that size. It’s a cheap big-art trick I have used elsewhere in our home. 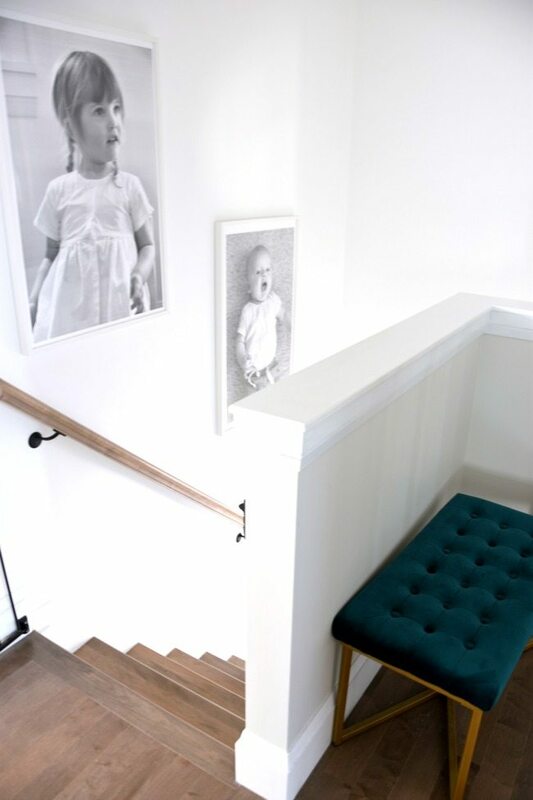 I had some photos I took of the kids printed as engineer prints and hung them going up our staircase. The great thing is that I can easily change out the photos as they grow up since it’s so cheap to have them printed! –Master Bedroom Makeover – Final Reveal! I totally went the engineering prints route for our last ORC (our living room)! 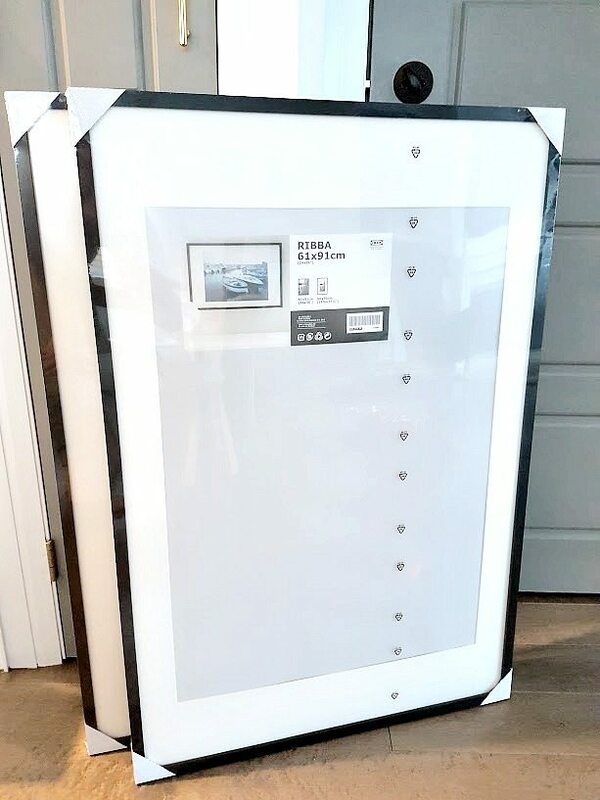 Even bought the same IKEA frames! 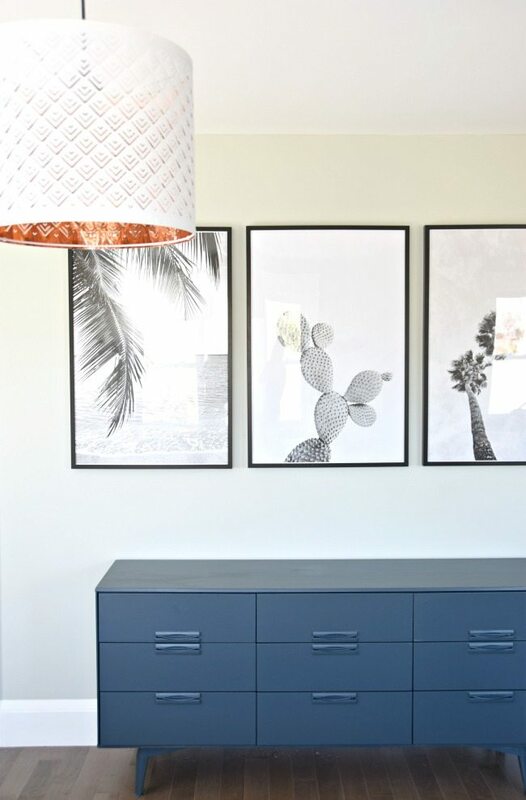 I love, love, love that you picked black and white pieces – definitely makes that light fixture pop! Thanks so much Oksana!! Aren’t they the best? I love the big art, it makes such a big impact! The three panels also create a great rhythm on the wall. Can’t wait to see more! I love engineer prints for decorating! I put some in my son’s room and it always gets compliments! I want to put some in my son’s room too – how many engineer prints are too many engineer prints? Ha. This is one of my FAVORITE tricks for big art! I have this exact thing going on in my office – I printed engineer prints of my two dogs and have them in those ribba frames too! So cute Jamie! Love that. love your print choices!! 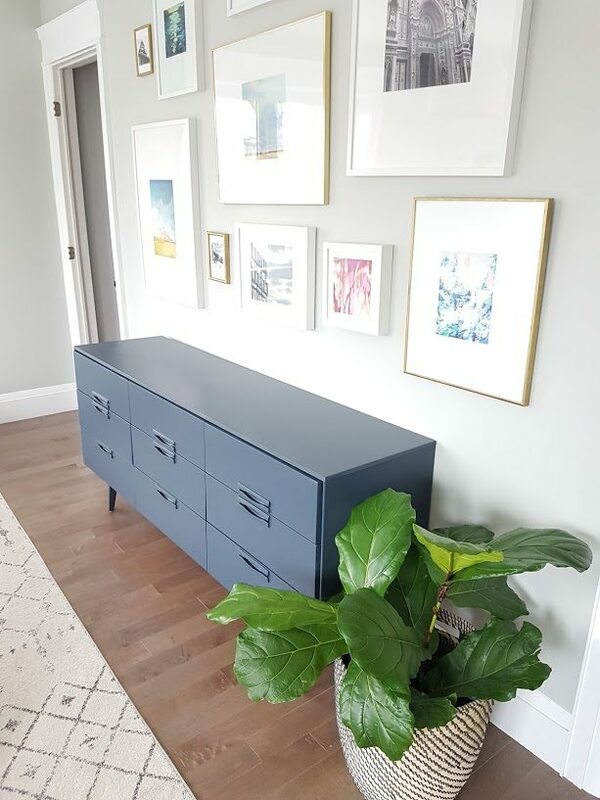 The light and the blue credenza look amazing with the new arts. Can’t wait to see more! Thanks so much Tim! I’m happy with how it’s coming together. Really appreciate your comment!! Looking good! 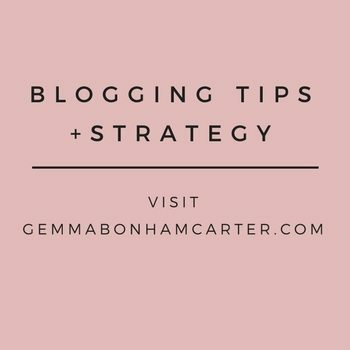 Love the drama of big art, Gemma. I always love the look of the engineer prints but always forget to try. Looks great. Love your print choices! love the light fixture aswell! 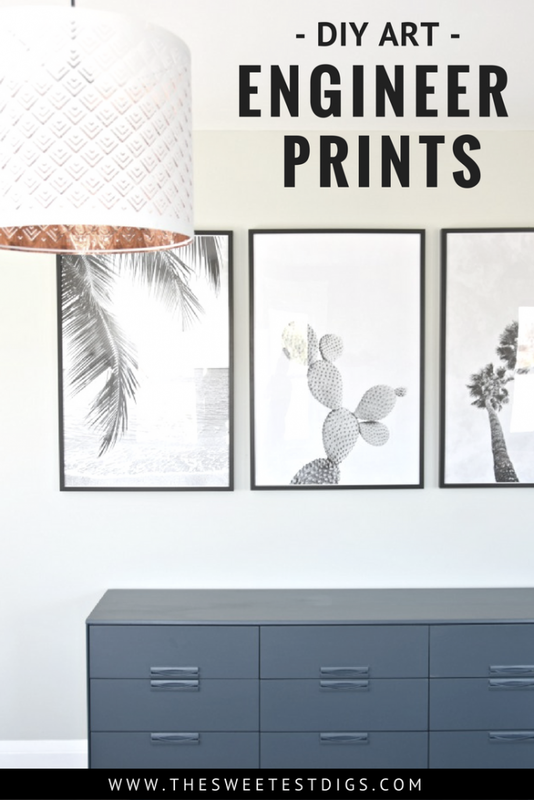 Aren’t those prints stunning? 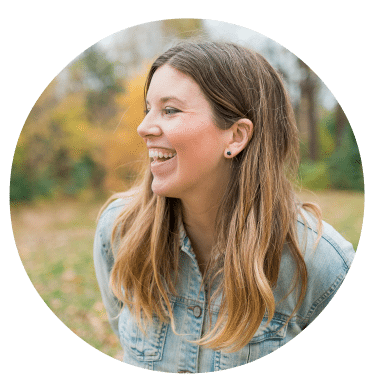 Etsy digital downloads for the win!